This PDF 1.5 document has been generated by Microsoft® Office Word 2007, and has been sent on pdf-archive.com on 14/09/2012 at 01:38, from IP address 24.44.x.x. The current document download page has been viewed 657 times. File size: 179 KB (6 pages). 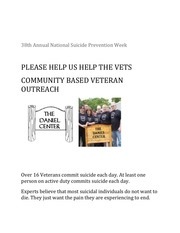 person on active duty commits suicide each day. die. They just want the pain they are experiencing to end. The Daniel Center is dedicated to that goal. Brain Injury] TBI, but not receiving proper treatment. according to official figures released Thursday. Veterans of America. “This has been a continuous problem. Staff Gen. Ray Odierno, former Joint Chiefs Chairman Adm.
— the wider Army is losing this battle, critics say. committed suicide so far in 2012. Last year’s total was 283.
what the veteran numbers are,” Tarantino said. facing U.S. troops after more than a decade of war. program to help vets suffering from PTSD,TBI and addiction. for us to purchase at an extremely favorable price. a dismissive attitude toward their very painful conditions. to open similar facilities in their communities. This file has been shared by a user of PDF Archive. Document ID: 00049377.